Roy is tied - with Sam Cooke - for my all-time favorite male vocalist, but he makes my list of songwriters because he wrote some pretty classic material. Songs like "Pretty Woman", "Only The Lonely", and "Crying" all have their well-deserved place in the pantheon of early Rock and Roll fame. But Orbison's songs were very unique. They often featured complex, non-repeating structures woven into dark, emotional ballads. In an era when most male performers adopted a bravado of strong masculinity, Orbison's songs typically conveyed vulnerability. Very little that Roy did was done "by the book", but much of it was legendary, making him a true, one-off original. Not to mention a genius. Roy Vernon Orbison came from the dusty, depression-era plains of Texas. For his sixth birthday he was given a guitar, and he later recalled that by the time he reached the age of seven, he knew that music would be his life. His youthful influences were centered around country music, but he was also exposed to healthy doses of latin, creole and rhythm and blues music at an early age. As a teenager, he saw Elvis Presley - only a year older than himself - performing in Odessa, Texas. Johnny Cash came through in 1955, and suggested to Orbison that he should approach Sam Phillips, the owner of Sun Records, the label of Presley, Cash, Carl Perkins and Jerry Lee Lewis. It was on Sun that his first single - "Ooby Dooby" - was released in 1956 and enjoyed some moderate success. For the last years of the 50's, Roy largely made his living as a songwriter, under contract with Acuff-Rose Music. He wrote "Claudette" (about his soon to be wife) which the Everly Brothers recorded for the B-side of their enormous #1 1957 single, "All I Have To Do Is Dream". But success as a songwriter and especially as a performer eluded him. A producer at Sun, Jack Clement, informed Orbison that he would never make it as a ballad singer. But by 1960, his sound - and his voice - seemed to come of age. He had developed a powerful falsetto, one that continues to amaze almost 60 years later. With that as a focal point embedded in a new "Nashville sound" backing, his single "Only The Lonely" zoomed to #2 on the charts. When Elvis himself first heard it, he bought a case of the 45's to distribute among his friends. Having found success, Roy continued to mine that vein. 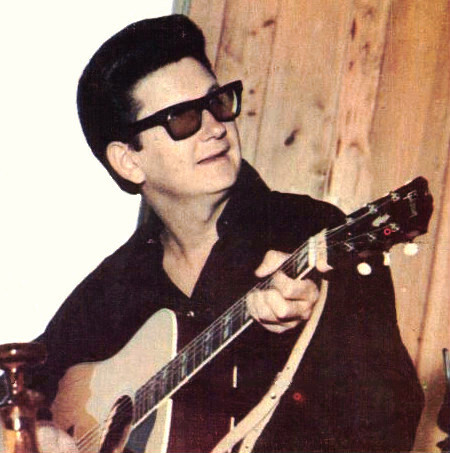 Usually collaborating, Orbison came up with songs like "Running Scared", "Crying", "It's Over" and "Pretty Woman". Not only did Roy become huge in the US, he was perhaps even bigger in the UK. In 1963 he toured the UK sharing top billing with the Beatles, who were still largely unknown in America. The young English musicians were intimidated and inspired by his talent and the effect it had on adoring fans. As time went forward, Roy Orbison's career declined, but he never went away. By the mid-80's, with David Lynch's seminal 1986 film "Blue Velvet" featuring the Orbison classic "In Dreams", Roy began an epic comeback. In 1987 he was inducted into both the Nashville Songwriters Hall of Fame and the Rock and Roll Hall of Fame. But all the glory of his long career was not yet behind him. By 1988, he was working with Jeff Lynne's support as a producer on a new album. This led to collaborating with Lynne, George Harrison, Bob Dylan and Tom Petty on the incredible Traveling Wilburys project. His solo album, "Mystery Girl", produced the hit "You Got It', written with Lynne and Petty. Roy Orbison was back in high demand. "It's very nice to be wanted again, but I still can't believe it," he said. That December, exhausted from a full work schedule and with his health noticeably declining, Orbison suffered a heart attack and was gone at the age of 52. Roy is correctly remembered as a Rock and Roll pioneer, but in both his songwriting and his performing styles he was sui generis, defying convention. There simply is nobody else like him. A New York Times writer, reviewing him in concert wrote "He has perfected an odd vision of popular music, one in which eccentricity and imagination beat back all the pressures toward conformity". Each of his songs seemed to follow a separate structure, eschewing the standard 32-bar form of alternating and repeating verse and chorus. His ballads usually included themes reflecting pain, loss, and dreaming. He was careful in concert to intersperse more typically bravado, up-tempo rockers in-between these ballads to avoid appearing too bleak and grim. His songs could almost be short stories. "I saw you last night, you held my hand so tight, as you stopped to say hello..." He used emotion - and drama - to drive his points home. One music critic has termed it "apocalyptic romanticism". Now THAT's something that I'd like to aspire to in my own efforts!! Stephen Thompson of NPR has said "Roy Orbison didn't just sing beautifully—he sang brokenheartedly". But when it comes to his songwriting as well as his artistry, maybe it was the Boss himself, Bruce Springsteen, who described it the best, in his 2012 SXSW Keynote Address: "[Roy Orbison] was the true master of the romantic apocalypse you dreaded and knew was coming after the first night you whispered 'I Love You' to your first girlfriend. You were going down. Roy was the coolest uncool loser you'd ever seen. With his Coke-bottle black glasses, his three-octave range, he seemed to take joy sticking his knife deep into the hot belly of your teenage insecurities." All I know is that it's impossible to feel completely lonely whenever Roy Orbison is playing somewhere in the background. I've decided to try something new. I'm going to go through an ordered list of my top ten personal favorite songwriters of all time! The list will be presented in reverse order, beginning with my tenth favorite and concluding with my absolute favorite songwriter of all time! It has been and interesting exercise to determine who my list would contain, and in what order. In contemplating it, I realized that I actually needed to consider TWO different lists: one of the greatest individual songwriters, and one of the greatest songwriting teams. That second list will follow this first one. In the interests of cleanliness, no one would be allowed to be on both lists. If a favorite songwriter of mine principally or significantly wrote as part of a team, they could only be considered as part of the favorite songwriter teams list. Hopefully that's clear, and without further ado, my 10th favorite songwriter of all time is....Chuck Berry! Chuck Berry was a tremendous innovator and pioneer of Rock and Roll. It was his guitar bravado and showmanship that cemented his stature as one of the prime architects of rock and roll, but it is his legacy as practically the arbiter of what an early rock and roll song should be about that truly defines his influence. A canonical definition of rock and roll at its birth was that it was a merging of black and white music which until the mid-50's had been kept separate and definitely not equal. Elvis sang R&B songs that sounded a little bit county, and country songs that sounded a little bit like R&B. Though it doesn't seem obvious to modern ears, Chuck Berry wrote and performed songs built around a pretty standard R&B framework that he goosed up and injected with just a dash of white country feel. But nothing - nothing - could be more emblematic of Chuck Berries songs than their thematic content. In the 1950's American dreamscape that Berry conjured so effectively that you knew you'd been there, school bells rang, jukeboxes played, kids danced, cars took to the open road, and hamburgers sizzled on a hot grill night and day. As artistic as his lyrics could be (check their influence on later artists that you may have heard of - John Lennon and Bob Dylan are only two - if you doubt it), the topics that Chuck weaved and spun so expertly into songs were intended to appeal to a wide commercial audience, white as well as black. At their best they painted a portrait, and told a story; one so vivid and authentic that the listener couldn't help but identify with it. As John Lennon once remarked, it you wanted to call rock and roll by another name, you could call it Chuck Berry. So all hail, hail, Chuck Berry. One of the songs on the upcoming new album is Yester-Me, Yester-You, Yesterday, a number written in 1966 by Ron Miller and Bryan Wells. It was recorded and released that year by Motown blue-eyed soul singer Chris Clark, but it found success as a 1969 single by fellow Motown artist Stevie Wonder. It reached #7 on the US Billboard Hot 100 chart and went to #2 in the UK. I've always loved Stevie's version, but I got really inspired when I listened to the original by Chris Clark. I just love that classic Motown sound! My version can't compare with those of these two brilliant and talented artists, but it was done in a spirit of tribute to Motown.